What Is a VA Form 21-686C? VA Form 21-686C, Declaration of Status of Dependents is a form used for applying for additional Department of Veterans Affairs (VA) disability compensation benefits for a dependent if a veteran has a service-related disability rating of at least 30%. A spouse, child, stepchild, and a parent or parents are considered to be dependents. The latest form was released by in June 2017 and superseded the now obsolete June 2014 edition. An up-to-date VA Form 21-686C fillable version is available for digital filing and download below or can be found on the VA forms website. The form describes the relationship between a veteran and dependent and specifies a dependent's status which - in turn - helps the authorities identify the benefits applicable in a particular case. Any changes in status - like the birth or adoption of a new child, a death, a marriage, a divorce, a child's marriage or college graduation - must be reported to the VA via the VA Form 21-686C. The VA cannot make adjustments to dependents' status or add and remove dependents automatically without being informed of the changes. The Social Security Number of newborn and adopted children must be specified in the form. For this reason, a veteran may have to wait for a couple of months before being able to add a new dependent. A veteran may also opt for changing the status of dependents electronically via eBenefits - electronic applications may be processed quicker. There is no need to file both the VA 21-686C and the electronic form at the same time. Both options are equal, and double applications may complicate and prolong the proceedings. What Is VA Form 21-686C Used For? The VA 21-686C is applicable for claiming increased payments if a veteran with a 30% disability rating has one or several dependents in their care. Another purpose of the form is to notify the VA about any changes that happen to dependents so that their eligibility for the extra compensation can be revised according to the new circumstances. The form can be filed even if the veteran is in the process of receiving their 30% rating. All information submitted via the form will be kept in their VA Claims File. How To Fill Out Va Form 21-686c? Where To Mail Va Form 21-686c? owed to the United States by virtue of your participation in any benefit program administered by the Department of Veterans Affairs. www.reginfo.gov/public/do/PRAMain. If desired, you can call 1-800-827-1000 to get information on where to send comments or suggestions about this form. veteran must sign in Item 17. 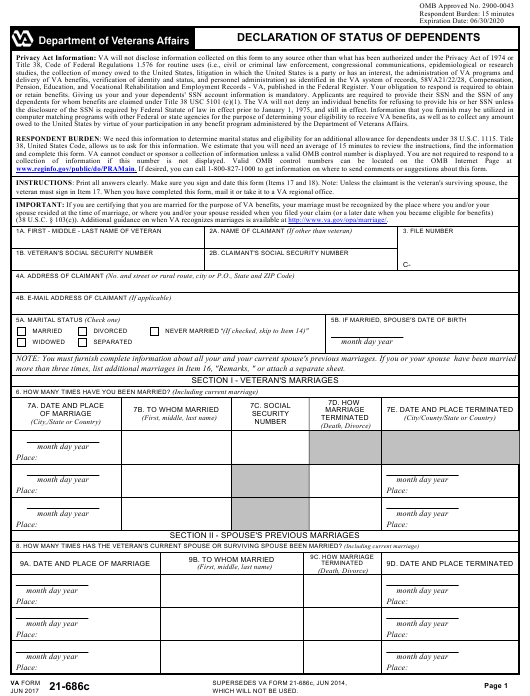 When you have completed this form, mail it or take it to a VA regional office. (38 U.S.C. § 103(c)). Additional guidance on when VA recognizes marriages is available at http://www.va.gov/opa/marriage/. (If checked, skip to Item 14)"
more than three times, list additional marriages in Item 16, "Remarks, " or attach a separate sheet. 6. HOW MANY TIMES HAVE YOU BEEN MARRIED? 10A. IS YOUR SPOUSE ALSO A VETERAN? 11. DO YOU LIVE WITH YOUR SPOUSE? 12. WHAT IS YOUR SPOUSE'S ADDRESS? 13. HOW MUCH DO YOU CONTRIBUTE MONTHLY TO YOUR SPOUSE'S SUPPORT? Note: In Items 14A through 14I, check all boxes that apply. 14J. IF YOU CHECKED "STEPCHILD," IS THE STEPCHILD THE BIOLOGICAL CHILD OF YOUR SPOUSE? Note: If any of the children listed above don't live with you, complete Items 15A through 15C. I HEREBY CERTIFY THAT the information I have given above is true and correct to the best of my knowledge and belief. of a material fact, knowing it to be false, or for the fraudulent acceptance of any payment to which you are not entitled. The form is made up of two pages with no filing guidelines provided in the form. Complete filing instructions are provided below. Item 1 is for the veteran's name. If another person acts as a claimant, their name is specified in Item 2a. Items 1b and 2b should contain the veteran's or the other claimant's Social Security Numbers. Item 3 is for the number of the VA file. Item 4 should include a claimant's postal and e-mail addresses. The applicable marital status is marked in Item 5a. If "never married" is chosen the claimant has to leave Items 6 through 13 blank, married claimants enter their current spouse's date of birth in Item 5b. Section I summarizes the information about a veteran's and their spouse's previous marriages. The total number of marriages - including the current one - is provided in Item 6. Items 7a through 7e are a chart for the information about the veteran's marriages. The required information includes the dates and places of each marriage, the name of the person to whom a veteran was married, the circumstances of the termination of marriage, and the dates and places of termination. Section II is for the information about the previous marriages of a veteran's current spouse. Item 8 is for the whole number of marriages. Items 9a through 9d are identical to Items 7a through 7e. Items 10 through 13 contain several questions about the veteran's spouse. Those living with their spouses must complete Item 14a. If a veteran and their spouse live separately, the spouse's address is given in Item 12, and any amounts of money they receive from the veteran is specified in Item 13. Section III is for the information about any unmarried children a veteran may have. Items 14a through 14c contain their personal information. This includes their names, dates, and places of birth, and Social Security Numbers. Items 14d through 14i give more information about each child and are completed if applicable. If any child is identified as "seriously disabled" in Item 14h, all supporting medical evidence should be attached to the form. Any step children related to the spouse must be listed in Item 14j. The information about children who do not live with their veteran parent is entered in Items 15a, 15b, and 15c. Item 16 provides space for additional remarks. A claimant certifies that the provided information is accurate by signing the form in Item 17. The filled-in copy of the form should be sent to the regional VA intake center that will process the documents and inform the claimant on any changes to their status.